Click here to download the printable seminar and demo schedule. Throughout the United States, bicycle co-ops help their local community. Offering programs for youth that include bicycle repair, job training and leadership training in safe space. As well as giving adults a place to learn how to make their own repairs through adult repair classes and DIY workshops. In this seminar you will learn about what coops offer, how they operate, and their role & impact within the the community. Presentation by Bill Mould, internationally respected wheel builder and author who has combined a deep understanding of physics and engineering in the design and building of over 5,000 bicycle wheels of every conceivable type. Bill will explain how a typical bike shop and their customers can enhance their ride experience by offering custom wheels designed specifically for the rider’s intended use. Included will be some important tips about wheel building that are not commonly understood but that can make a big difference in the strength, durability and resilience of wheels. Not only does a rider feel the difference on every ride, but a good set of wheels built for your application will last for years! Seminar sponsored by Velocity USA. product innovation, influencer marketing, pop culture, urban cycling as a lifestyle and are a cultural movement on to itself. Participants will learn from three brands and a veteran bicycle messenger about the growing cycling business in urban cities. Isaac Denham (owner of Befitting Bicycles, formerly the director of Fit Service for Bike Line) will discuss using real time pressure readings to assess and correct support issues at the pelvis as well as help with saddle selection. Isaac will also address different saddle uses and shapes as they relate to support and discuss what saddle options may work best for you based on your desired type of riding. Daniel de Visé is an author and journalist. A graduate of Wesleyan and Northwestern universities, he has worked at the The Washington Post, the Miami Herald and three other newspapers in a 23-year career. He shared a 2001 Pulitzer Prize and garnered more than two dozen other national and regional journalism awards. His investigative reporting twice (see here and here) led to the release of wrongly convicted men from life terms in prison. His first book, I Forgot To Remember, published in 2014 from Simon & Schuster; it began as a front-page article de Visé wrote for the Washington Post about his co-author, Su Meck. His second book, Andy & Don, also from Simon & Schuster, began as a journalistic exploration into the storied career of his late brother-in-law, Don Knotts. The Comeback, his third book, drew inspiration from a childhood immersed in Chicago’s bicycle-racing subculture. Daniel is married to Sophie Yarborough, a senior editor at The Washington Post​. They and their children live in Maryland. Presented by Trophy Bikes. A grimly funny and informative anti-bike-theft workshop and Krypto Kwizzo at the end for a chance to win a Kryptonite lock! Saturday, October 27th and Sunday, October 28th, all day. Happy Freedman is passionate about bicycling and creating a synergy between the cycling and medical communities, advancing the science and art of bike fit, to help riders of all abilities to achieve their performance goals. He has been instrumental in developing the first multi-disciplinary hospital-based state-of-the-art Bike Fit program of its kind, here at HSS, where he has worked in a range of capacities for over ten years. He works in close cooperation with physical therapists and investigators in the motion lab, and the new bike fit program will advance performance, clinical bike fit evaluations, and research. Happy has presented on bike fit at the International Cycle Fit Symposium in London and numerous events throughout the US. He is a founding faculty member of the Medicine of Cycling Conference held annually at USA Cycling in Colorado Springs, where he presents both on Bike Fit as well as on Medical Emergencies in Cycling. He is on the advisory committee of IBFI, the International Bike Fit Institute, and formerly faculty at the Bike Fit school, established by Ben Serotta. He is an experienced cycling coach, including over ten years for the Columbia University D1 Cycling Team, as well as having been a certified coach and official for the United States Cycling Federation. Happy focuses on fitting the cyclist, not the bike, to address the individual needs of the rider, and collaborates with staff in Performance Services to develop an evidence-based protocol for bike fitting. Join the Philadelphia Dynamo Headlight Society on a casual nighttime road and gravel ride. 25 miles, no-drop, All bikes with dynamo lighting are welcome! SUN. 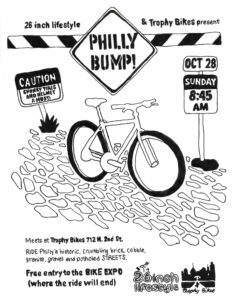 Oct. 28, 8:45 a.m. SHARP at Trophy Bikes, 712 N. 2nd St.
We will test out our bike-handling and sense of humor on some of Philly’s most historic (and battered) streets. Bring your favorite chunky-tired bike (plus tools + patch kit) and BE PREPARED for bricks, staircases, cobbles, Belgium block, granite block, gravel, mud and ancient railroad tracks. FREE, includes an optional toast in an alley along the way. THERE WILL BE A PERFECTLY FRIENDLY FOOT-DOWN DERBY. Ride ends at PHILLY BIKE EXPO just about opening bell; FREE ADMISSION for FIRST 50 RIDERS at the start. • RSVP please to info@trophybikes.com with BUMP in the subject line! SAT. Oct. 27, 8:45 a.m. Meets at central info booth, AMTRAK 30th St. Station, 30th & Market Streets, PHL. This Brompton-only ride will go up, over, under and around some of Philadelphia’s most interesting old and new streets before winding up at the PHILLY BIKE EXPO just in time for doors open. ALSO: Every BROMPTONEER gets a FREE EXPO ticket. •Please RSVP to info@trophybikes.com with “Brompton Roll” in the subject line. Note: BROMPTON folder bikes ONLY, please. The Youth Advisory Committee OF Bicycle Coalition Youth Cycling would like to invite you to ride with us to the 2018 Philly Bike Expo. The Philly Bike Expo will be on October 27th & 28th. Join us on a casual paced 15-20 mile tour of our favorite trails and gravel roads in Philly. Cyclocross bikes recommended, MTB’s or thick tire road bikes will do fine. 8:30am – BCYC Youth and Coaches meet to get bikes. 9:15am – Roll Out. Belmont Fire Road. MLK Drive. Forbidden. Boxer Trail. Sedgeley Porter House? Convention Center.